My 76 has a 360 and 727 and we are having an issue where the engine just shuts off. Thermoquad was purchased as rebuilt form a forum member but divorced choke issues made it seem like fuel was leaking from the throttle shafts (that was user error). While getting it checked out the mechanic was running it for a few minutes and it just shut off. It will fire right back up so it's not looking like fuel issues. I have had the truck just cut out while trying to park and it will fire right back up each time. My suspicion is electrical issues. i have a spare FBO distributor and chrome ignition box. new starter relay and ballast resistor are installed. Currently running a factory distributor and FBO ignition box. sometimes the truck acts like a neutral safety switch issue where it doesn't want to start- no crank- nothing- but then it will crank and start. new neutral safety switch didn't change anything. Could it be the ignition wiring in the column? Other ideas? We have owned this truck since new so ask any pertinent questions to gather more info. 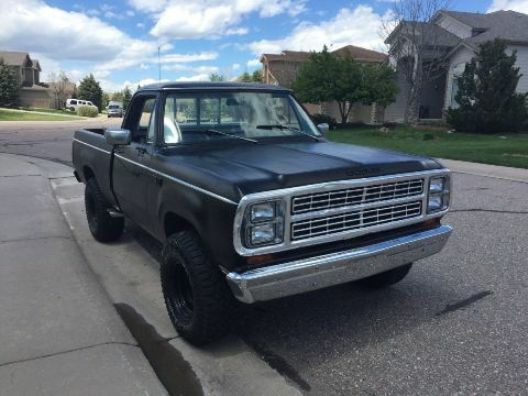 1976 Dodge Californian 360, Thermoquad, 727 trans, 9.25 rear with 3.21 gears and a sure grip style rear. Bulkhead or ignition switch. Have had the same issues with either one. Used to own a '76 Club Cab with similar issue, turned out to be a connection issue where the ignition switch plugs into the main harness (midway down the column). I found the issue by accident. Sitting with the truck one night waiting for it to warm up, I saw a very faint flash down low and the truck cut off. Closer inspection the next day, (if I remember correctly) the main power line and the start line were burnt at the connection. Bulkhead at the firewall or the amp gauge connections are melting down. NHRA Stock/SuperStock Class Racing..Engineered Muscle In Motion! My dad had a 76 Dodge pickup we went through this process with many years ago. I think he replaced nearly everything on the truck searching for the cause. In our case, the wire terminal to the coil had all be a few wire strands that were broken. Installed both new terminals on the coil and he never had a problem again. Thanks for the tiips everyone! I just remembered that I had the stereo powered by a wire coming from the column with one of those cheap connectors that cuts into the wire. I'll mess with that first and proceed to the rest of the suggested connections! definatly sounds like a loose/bad electrical connection. And even the battery cables themselves. Battery cable wouldn't cause a shut off normally because the alternator will continue to supply enough power to run the truck. I drove the truck today and it shut off just as I got to my destination. Didn't think anything of it as it's done it before. Actually shut off as I was backing up from my brother's house, but fired up. Just went to start the truck and there's no power, no done light, no seat belt buzzer, no headlights. Don't have an oh meter to check but I saw two fuseable links from the battery cable. I'll be checking those tomorrow. Electrical problems are easier to find when the fail completely. Finding intermittent electrical problems is sometimes a real pain. Just went to start the truck and there's no power, no done light, no seat belt buzzer, no headlights. That says bulkhead all over it. Check the big red wire at the bulkhead. Push on it really hard. Does anyone know the amp rating of the fuseable links? If I need to replace them, I don't want to go too high and burn something, or too low and have them fail often. Fusible links are 4 wire numbers smaller than the wire they are protecting. So a 12 fusible protects an 8 wire etc. BUT.....(correct me if I'm wrong) a fusable link is much like a regular fuse in that it's either good, or it's not. There is no in between. Check that bulkhead. You'll probably find a few burnt/melted connections. Seems logical. I've only had one fusable link failure, and there was no intermittent issue. It just left me stranded, no warning. It looks like a loose stud at the ammeter. I've taken the gauge out and bolted the connectors together and wrapped it with lots of tape. It will run and I will try getting it home now. The fuseable links checked out ok too. In the past when one failed, it was like a blown fuse. Thanks for the tip on 4 gauges smaller on the wire size! What is the company that converts the dash and harness from ammeter to volt meter?